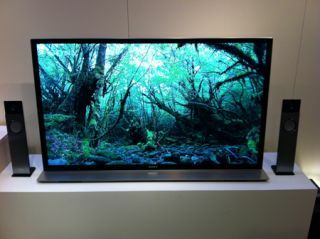 Sony sets eco targets for flatscreen TVs | What Hi-Fi? Mindful of soaring electricity prices, Sony's TV division is working hard to reduce the energy consumption of its flatscreen TVs. In a demonstration at its Tokyo eco centre, the company ran two 55in LCD screens alongside each other: last year's 55KDL-EX723, and a 2012 55KDL-HX753. The older model consumed up to 112W according to the electricity meter we saw, while the new one ran between 40-80W. Sony claims the latest 55KDL-HX753 will drop down to an energy consumption of 40W during darker scenes, and won't go above 100W when displaying very bright pictures. Eventually the company aims for an average power consumption of 1W per inch of screen size, so 55W on a 55in screen, 46W on a 46in model, 40W on a 40in screen and so on. And those figures should improve even further when the firm starts producing OLED screens – which it's developing for its professional broadcast division – with a further 30-40% energy saving over LCD.